I’ve always walked my dogs, so I wasn’t totally unfit before starting jogscotland – but I wasn’t totally fit either! For eight years, my husband and I had tried for a baby, and we finally decided to try IVF. But when we talked to the doctors, they said that to be eligible for it, I’d have to lose five and a half stone. My friend Arlene Botha had set up a jogscotland group called The Galavanters in our home town of Galashiels, and she persuaded me to go along. I started in April 2015, and I was a bit nervous about it, but Arelene’s a good friend, and she was so supportive – she makes everybody welcome. It doesn’t matter what size you are, how fit you are, it doesn’t matter if you can only run for 20 seconds, she makes you feel welcome and she can see your potential. 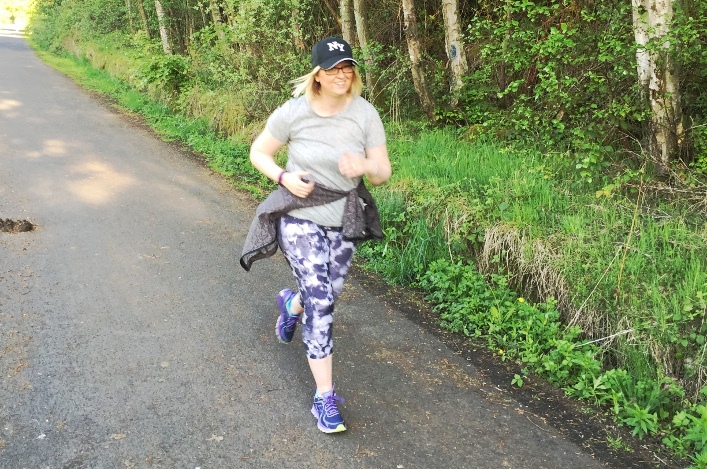 I just absolutely loved it – I quickly got the fitness bug and wanted to run the whole time. 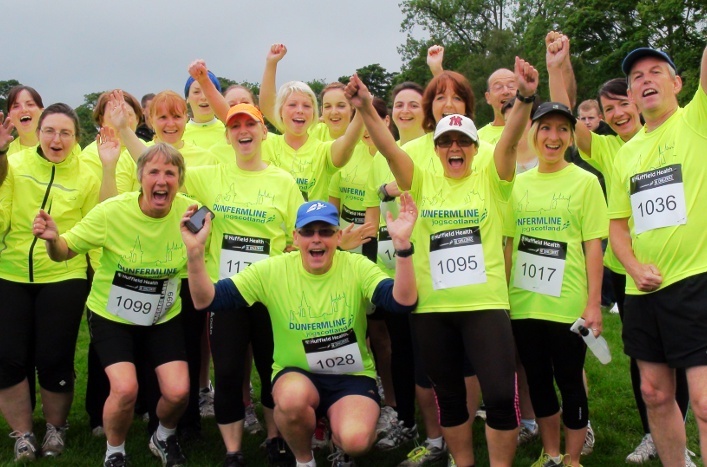 I gradually built up, and then took part in my first race – it was one of the jogscotland Challenges, the Hawick 5K. When I was running it, I was thinking: “I don’t know why I’m doing this!” But I was with my friends from jogscotland, and we were all there for each other. I got to the finish line and my husband and my mum and dad were there and everyone was there to cheer for me – it was brilliant. In December, I started the Marcothon, where you aim to run every day of the month. By that point, I’d lost four stone in total and was feeling great. But I got as far as 18 December on the Marcothon, and I had to stop because I was so tired. At that point, I didn’t know why I was so tired. Then on the Tuesday before Christmas, I found out I was pregnant! 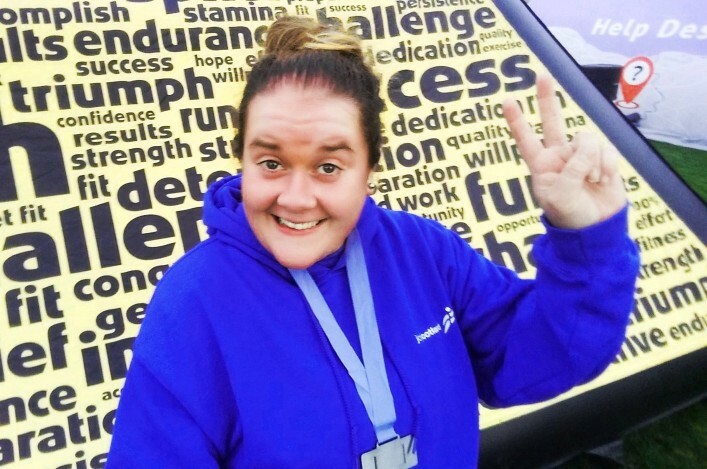 When I spoke to the doctor, I told him about the running, and how much weight I’d lost, and he said I’d probably got pregnant because I’d got myself so much fitter and healthier. I hope that after the baby is born, I’ll be able to join the Galavanters Mums on the Run group. I’ve already decided that my goal for 2017 is that I’m going to get back to the running again, back to the Galavanters and this time I’m going to aim for 10K. The support that you get from Arlene is unbelievable. I talk to everybody about Galavanters. I wear my T-shirt out and about, and the amount of people that have stopped me to ask about it is amazing. I recommend it to everyone. It makes you feel good, it makes you feel that you’re achieving things – it’s just such a brilliant thing to do.